The Need for Grace: All humans are sinful by nature and sinful by action. Their sinfulness makes them unable to perform anything that might make themselves acceptable to God, “For all have sinned and fall short of the glory of God (Romans 3:23).” Therefore, their only hope lies in the grace of God. The Divine Provision of Grace: God, by Himself, without human assistance of any kind, provides grace for any and all members of the human race. This grace is provided through the cross work of Jesus Christ, “being justified as a gift by His grace through the redemption which is Christ Jesus (Romans 3:24).” God will only accept the work of the Lord Jesus on the cross on behalf of sinners. The Results of Grace: God gives all the spiritual benefits that He through grace could design for each sinner who believes, “Blessed be the God and Father of our Lord Jesus Christ, who has blessed us with every spiritual blessing in the heavenly places in Christ (Ephesians 1:3).” All our sins are forgiven, the righteousness of Christ is given to us, and all the necessary wisdom and power to function as a believer is given to us. 1) SALVATION: We are saved from our sins by grace (Ephesians 2:8-9). 2) CHRISTIAN LIVING: The life of a Christian is under grace (Romans 6:14; 2 Peter 3:18). 3) CHRISTIAN SERVICE: The believer’s service is by grace (Hebrews 12:28). 4) CHRISTIAN HOPE: We look to Christ’s return by grace (1 Peter 1:13). 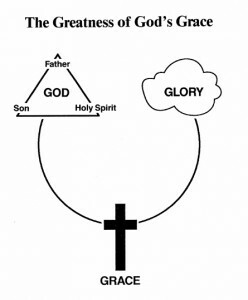 1) All of us have sinned and fall short of God’s glory (Romans 3:23). 2) We cannot save ourselves (Ephesians 2:8-9). 3) The Lord Jesus Christ died to save us from the eternal penalty of sin (1 Corinthians 15:3-4). 4) Christ died to save you, that by the grace of God He might taste death for everyone (Hebrews 2:9). 5) Will you receive Him as your Savior now?